Moose Jaw, Saskatchewan will host a unique set of events this coming weekend – the second Saskatchewan Versatility Ranch Horse Competition, and for the first time ever – the Coteau Range Barrel Racing Futurity and Derby. Both events will take place August 13 – 15 at the Golden Mile Arena in Moose Jaw. 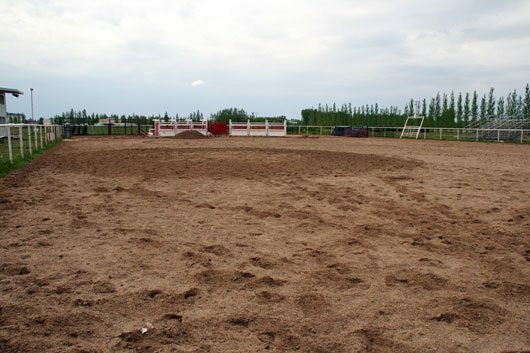 (Versatility competition in the indoor arena and the barrel racing events in the outdoor pen). The barrel racing event features a $10,000 added purse ($6,000 in the futurity and $4,000 in the derby), courtesy of Youngs Equipment Ltd. of Moose Jaw. Barrel racers commence with their first of two long-go runs Friday, Aug 13 at 3:00 pm. The second go is staged for Saturday at noon with AQHA-approved Open and Youth Barrel Races and a SBRA Jackpot later Saturday afternoon. The Futurity and Derby short go is set for Sunday, Aug 15 at 9:00 am Sunday morning followed by another Open/Youth barrel race and SBRA jackpot. The Ranch Horse Versatility side of the weekend begins Saturday morning at 8:00 am (Open and Amateur), with each competitor competing the trail pattern then the ranch riding pattern around the perimeter of the trail pattern. Youth Ranch Trail and Ranch Riding follow with Cutting staged for the afternoon. Saturday evening features an Exhibitors Supper and Sponsor Recognition event with the balance of the Ranch Horse Versatility competition running on Sunday along with the Barrel Racing events. Event producers have worked hard to secure sponsorship. In addition to the $10,000 Youngs Equipment Ltd. Futurity/Derby purse, the Open Division Versatility Ranch Horse Champion will receive a one year lease on a new Exiss Stock trailer sponsored by Moose Jaw Toyota Trailer Sales. Champions in the Open, Amateur and Youth will receive championship buckles. Novice Amateur and each individual class winners will receive a blanket. There is no charge for spectators to attend the event – which should be exciting with some of Canada’s top barrel racers in attendance along with a talented slate of Versatility competitors and cutters. A highlight of the event is the draw for a raffle colt. Spectators and exhibitors are encouraged to purchase a ticket on the raffle colt to help fund this event and future events. 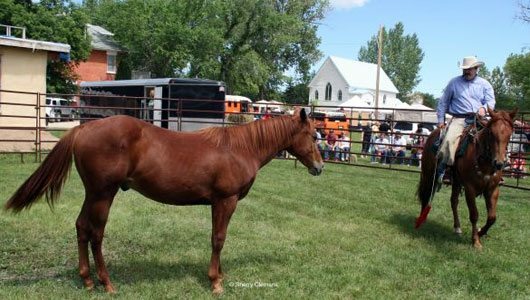 To be raffled off is an outstanding yearling gelding donated by Fafard Ranch Horses, (Glen Fafard of Mortlach, Saskatchewan home of Leos Last Sensation). Visitors to Moose Jaw, “the friendly City” can be expected to receive some of the most genuine hospitality to be found anywhere. Moose Jaw is rich with history and is one of the best places to visit on the prairies. Numerous attractions exist in Moose Jaw such as Casino Moose Jaw, Temple Gardens Mineral Spa, Sahara Spa, Crescent Park, Golf Courses galore, Museum and Art Gallery, Western Development Museum, Murals of Moose Jaw, Saskatchewan Burrowing Owl Interpretive Centre, Tunnels of Moose Jaw, and the Yvette Moore Art Gallery to name a few.